Living with chronic pain can be difficult – emotionally and physically. It can also be frustrating, especially if you have tried many treatment options without finding sufficient, long-term relief. If chronic pain is keeping you from doing the daily activities you enjoy, you may be interested to learn about an option called spinal cord stimulation (SCS). Over-the-counter pain medications and lifestyle changes such as: physical therapy, counseling, exercise, diet, and rest. Prescription pain medications and injection therapy. Long-term therapy, including implantable drug pumps or spinal cord stimulation. Spinal cord stimulation — a viable alternative. Spinal cord stimulation, or SCS, is a therapy that has been helping people manage their chronic pain for more than 40 years. SCS works by masking or interrupting pain signals as they travel up the spinal cord to the brain. And while it can’t cure or eliminate the cause of your pain, for many people, SCS can provide control over certain types of chronic pain. Who is a candidate for SCS? Not everyone with chronic pain is a candidate for spinal cord stimulation therapy. Candidates for spinal cord stimulation generally have chronic pain in their arms, legs or back for six months or longer. Their pain is “neuropathic,” meaning that it produces a burning, tingling, or numb sensation; and they have not found adequate relief with other treatment options. If you would like to find out if you are a candidate, talk with your doctor about SCS and its risks and benefits. A significant reduction in chronic pain1,2,3. A reduced need for oral pain medication2. An improved ability to perform daily activities1,3,4. As with any treatment plan, the exact measure of success with SCS depends on the individual. In general, SCS is considered successful if you experience at least a 50% decrease in your pain1. In addition, you can try the therapy for a short time before committing to it long-term. The therapy also provides you with the ability to adjust the level of stimulation to your needs. Possible risks of SCS therapy. 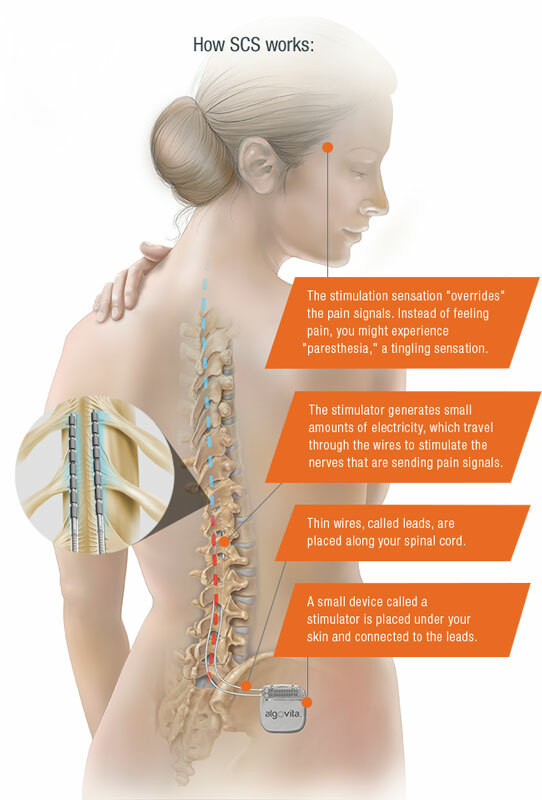 Ready to learn more about spinal cord stimulation therapy? Click here to discover the path to pain relief.